Hey everyone! Today, I have another all green post for you. I have over 200 OPI's in my stash.....and only five greens?! I had a lot of close call greens, but really? Only five? I really need to work on that. From the Summer 2014 Brazil Collection, this is an amazing jungle green. I bought this one at Sally's. The formula was great, the application is smooth, and it can be carefully applied in one coat. I used two coats for my swatch. AmazOn...AmazOFF is a stainer, so beware! From the 2014 Gwen Stefani Holiday Collection. I bought this one at Ulta. The formula and application of this one is also great. My swatch is shown in one coat. I have used this one several times, usually during the holidays because it's a true Christmas green. I have water marbled with this one and stamped with it. It's also one of those that'll stain the dickens out of you if you're not careful. The formula is slightly separated. Look at the bottle in my picture. That's what you call ugly bottle syndrome. It doesn't effect how it applies to the nail, but it sure is ugly to look at in the bottle. Another Ulta purchase. 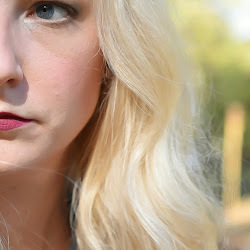 This is a great formula and my swatch is shown in one coat. 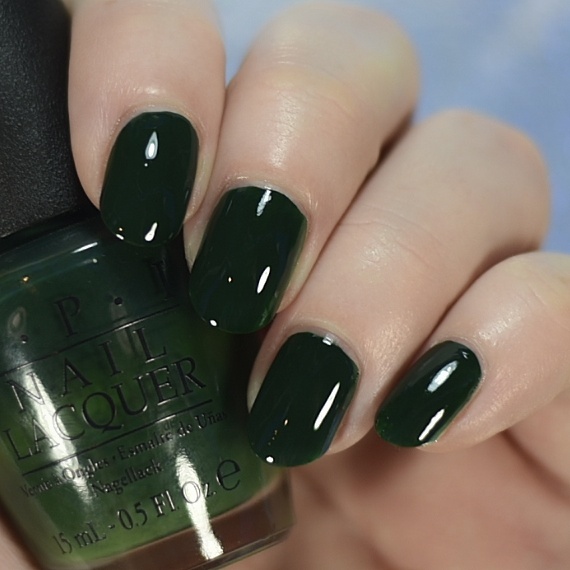 I think this one is definitely my favorite out of all my dark green polishes. It's not too dark, but not too true green. This one also has ugly bottle syndrome. Yikes! 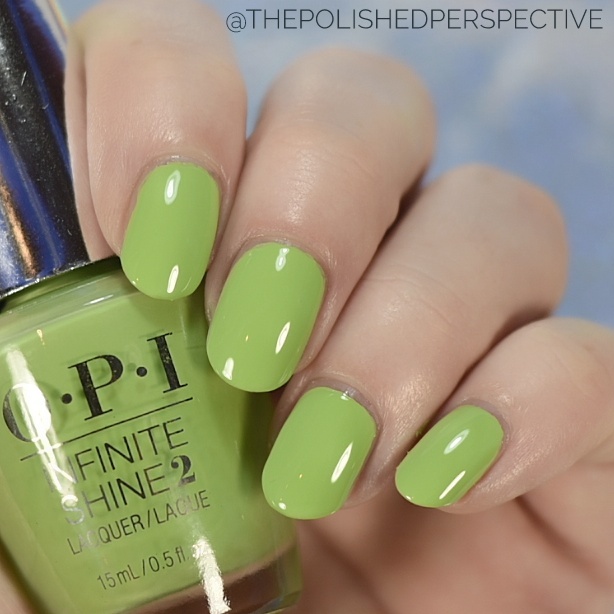 I know the title indicates this is a lime shade, but compared to my other OPI lime, this is more chartreuse. I received this one as a press sample through Preen.Me. I swatched it once and haven't worn it since. I'm not much of a fan, but I may wear it again, I dunno. Maybe I should just get rid of it. My swatch is shown in two coats. Here's my other OPI lime. This one was part of a neon collection where you're supposed to use a white base coat. I'm a rebel and I don't wear a white base. Guess what? It looks just fine without it. I like the formula on this. It's a little squishy and requires three coats for opacity. It also dries slightly matte, so you need a glossy top coat with it. I use this one a lot on my toes during the summer. See what I mean about To the Finish Lime being chartreuse and this one a real lime shade? I'm not crazy, right? Well, that was fun! 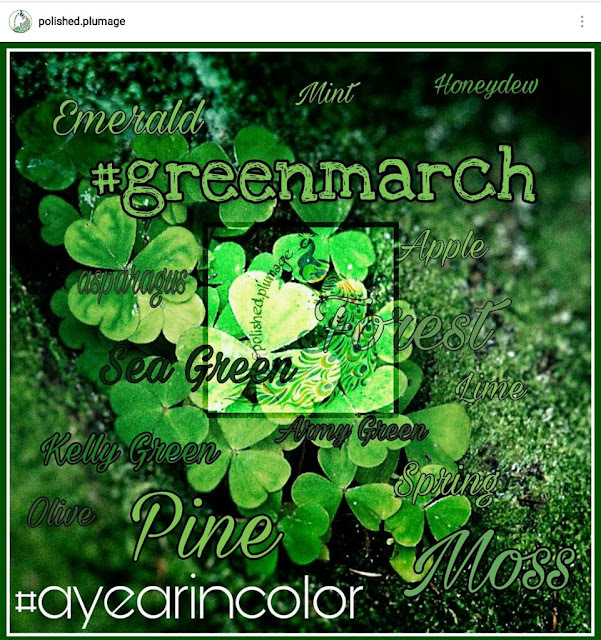 I can't wait to start working on my next A Year In Color Post!